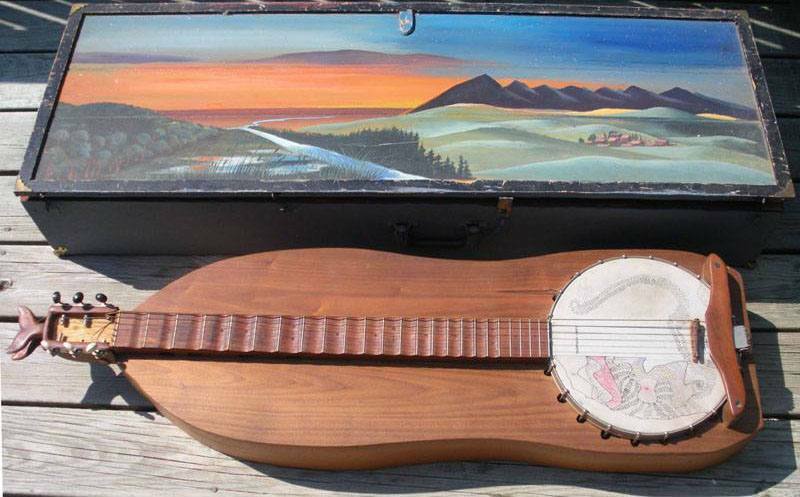 How do you make a bass dulcimer that can compete in a string band? Sink a banjo into it. In the upper register its tone resembles a sarod's. The lowest note is G, using thick steel guitar strings. The scalloped fretboard (of the same wood as Indis's body) makes for easier vibrato and bending. The double whale-tail ornament on the mahogany pegbox was fun to do. 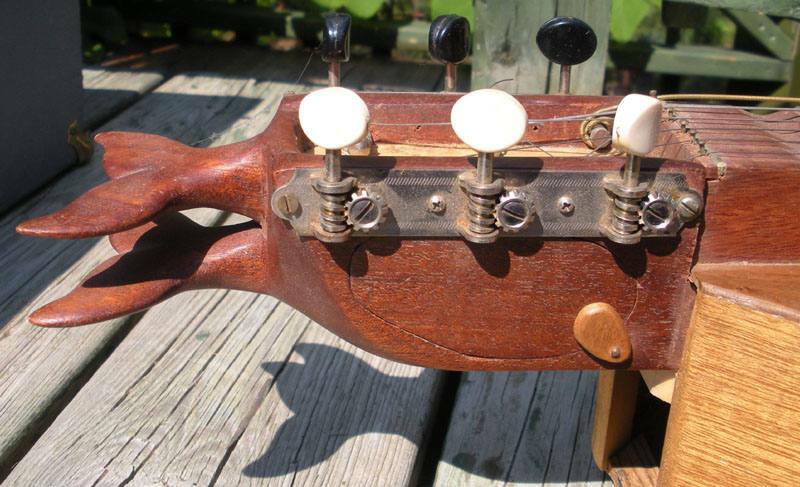 The piece of mahogany spanning the banjo head is a handrest for fast single-string picking. Small round fret-markers of wood dust and glue. Walnut top and back, light mahogany sides. Open tail end for volume and miking. The box's painting is the landscape of Michlad (WAY east of Gondor) by Patricia Windrow per my instructions. The banjo head design is a freeform "intestine" doodle of my own in rapidograph ink. Piece of trivia: this dulcimer's name is the Quenya version, though not a cognate, of my own Elvish name, Aldaron. Scroll down for a closeup of the cool double whale tail pegbox. Why are the machine heads different colors? Why not. What is the little piece of maple on the pegbox near the dulcimer body? The swivel-latch for the pick-and-capo-holding box. Why is there so much space between the bottom of the pegbox and the bottom of the dulcimer body? For more sound to get out.